Discussion in 'Standup Technique' started by karnifx, Jun 7, 2014. I went through the article and to me it seems plausible, in practice it would help if you could actually find someone to drill the ideas out with you. Wilson Pitts and Lyte Burley are both students of boxing and Tai Chi, particularly Bagua. It's definitely doable, and Wilson, a very intelligent guy, would tell you that the two make an excellent combination. In fact, here's a cool video for you explaining some of Willie Pep's boxing through the lens of Tai Chi. Wilson made this. Edit: By the way TS, is your name a reference to the Book of the New Sun? If so, bravo. Terminus est. Cool. Somebody else with a pretentious Latin screen name! I bumped another thread for you, as well, which compares boxing and Baguazhang footwork. Might be some interesting stuff in there for you. lol, no it actually has personal resonance with me. Plus I like the band. I catch a lot of flack being who I am, might as well play the part is all. Yeah, I get that. I didn't mean to mock your name or anything. I was just poking fun at my own screen name. 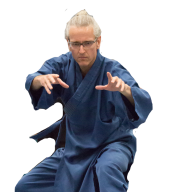 It is great that some combat arts are combined with Tai Chi Chuan. Nice to see a fellow fan of such beautifully written book. I'm a certified Tai Chi instructor (William CC Chen lineage), and it definitely helps my boxing. It's very useful for power generation, body structure, and the push hands really does help your inside fighting a lot. I'm very sensitive to how people are moving in the clinch, it makes defense and finding openings much easier. In my experience: Just do your form and then watch a lot of boxing videos. Not kidding. The mirror neurons in your brain will take care of the rest.